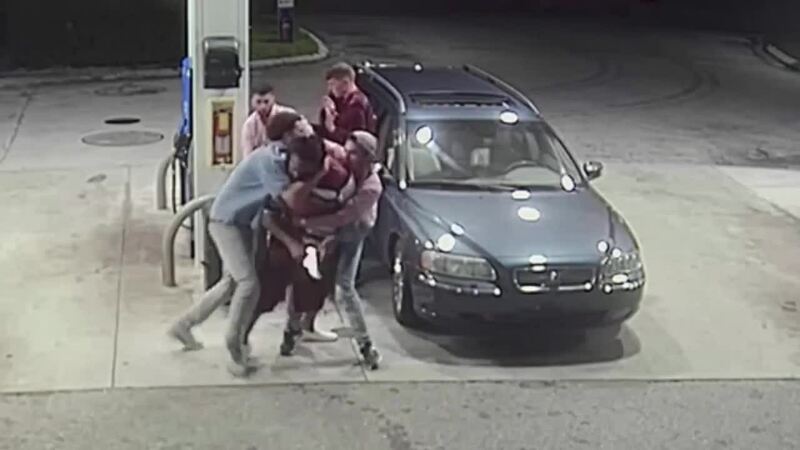 BROWARD COUNTY, Fla. — A group of spring breakers from Indiana foiled a robbery at a Florida gas station when they turned the tables on the would-be robber, tackling him and taking his gun. Ivy Tech graduate Alex Wisbey told WPLG he and his cousin Aric Wisbey were in Florida to celebrate a birthday. Alex told WPLG he was the designated driver and had stopped at the Mobil gas station in Oakland Park around 3:45 a.m. because they were running low on gas. While they were at the pump, Alex said a black car pulled up and a masked man approached them with a gun, demanding money. Before anything could happen, Alex and Aric told WPLG that they grabbed the gunman and tackled him to the ground. Detectives say a shirtless accomplice then ran up to join in the struggle. “At any point in time, that gun could have gone off,” Aric, an Ivy Tech student, told WPLG. Aric Wisbey said his instincts kicked in and he grabbed the gun and pointed it at both men, who then got back into their vehicle and drove away. WPLG says the whole incident was recorded on the gas station’s security cameras. Police arrested Kevin Campbell, 33, a short time later. The masked man remains at large. The cousins told WPLG that they both have concealed weapons permits in Indiana and have experience with firearms. They said deputies told them they were lucky because the gun was loaded. The Broward County Sheirff’s Office is still looking for the second suspect.